The Platinum Elite Level Strapped mouthguard from OPRO is the most advanced Self-Fit OPRO mouthguard in the range. What is the OPRO Platinum Mouthguard? It is the most advanced and elite level mouthguard in the OPRO Self-Fit range. It harnesses an inter-jaw absorption layer thanks to its dual layer construction. This provides additional shock absorption between the upper and lower jaw. The Strapped OPRO Platinum comes with an anti-microbial case, which means you can store your mouthguard safe in the knowledge that it’s protected against up to 99.99% of bacteria growth. How do I fit my Strapped OPRO Mouthguard? Fitting your mouth guard is simple and easy. The OPRO Platinum Strapped Mouthguard takes minutes to mould, and once moulded to your teeth will provide you with a comfortable and protective gum shield for whatever ball, stick or combat sport you play. Each pack comes with a fitting cradle, allowing you to place the mouthguard straight into your mouth. This not only ensures that it fits correctly when you mould it, but it also means you won’t have a wonky mouthguard too! Your Platinum Mouthguard has 13 anatomical fins that have been placed in exact positions to mould to your teeth snuggly. When the mouth guard in dropped into hot water, the fins, which are made of a ultra-flow gel material soften, so that when you compress them against your teeth and gums, creates a mouth guard unique to you. I wear fixed braces, can I use the Platinum? 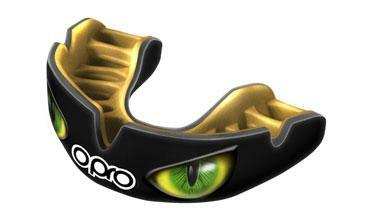 You can’t wear the Platinum if you wear fixed braces, however we do have OPRO Gold Braces Mouthguard. How do I order my OPRO Platinum Mouthguard? Ordering your strapped mouthguard from OPROMouthguards.com is simple easy and secure. Remember that if you place your order by 3pm on a working day, you could start using your mouth guard as early as tomorrow! So why are you waiting, choose your design, add to your basket and enjoy the comfort and fit of your very own Platinum Mouthguard.